Northrop Grumman Corporation unveiled its «Vanguard» radar solution; a multi-function, open architecture system that can be easily scaled and applied to multiple missions and platforms. «Our Vanguard solution redefines the way we produce radars and the capabilities possible within one flexible, scalable design», said Paul Kalafos, vice president, surveillance and electromagnetic maneuver warfare, Northrop Grumman. 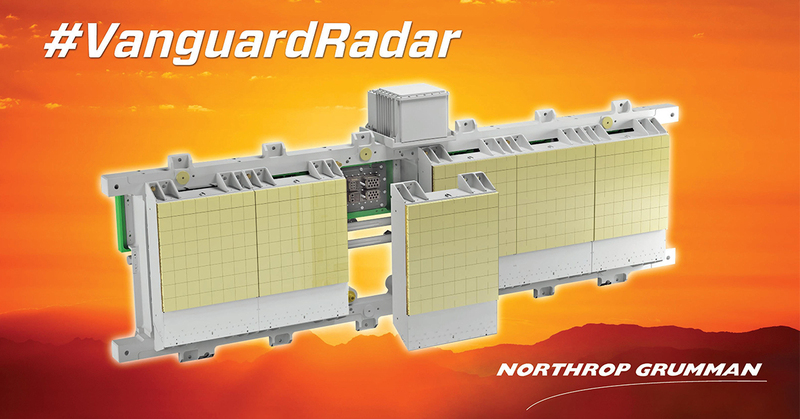 «Vanguard’s modular radar panels are a building block for a multitude of future radar aperture applications». With its modular, panel-based structure, each radar panel represents a flexible building block that can be tailored to meet changing mission requirements. Each panel can act independently as its own radar, but can also be connected with the desired number of other radar panels to form one single, larger radar array. Each panel is also field replaceable, creating life-cycle cost savings and preventing long maintenance delays that prevent operation. Large and small systems alike can use the same Vanguard radar building block, allowing for rapid, cost effective production and maximum system maturity. Northrop Grumman has conducted more than 10 rigorous test flights and the Vanguard radar continues to exceed expectations and show exceptional stability, reliability and performance. Crucial modes to the air-to-ground radar mission, including Ground Moving Target Indicator, Dismounted Moving Target Indicator, and Synthetic Aperture Radar mapping were executed successfully in Northrop Grumman’s first test flight of its solution in April 2017. Since that achievement, Vanguard has also shown the ability to rapidly adopt third party software and interface with the Open Mission Suite Battle Management Command and Control system.